What is the actual risk level from various types of damage to asphalt asbestos floor tiles, vinyl asbestos floor tiles, or asbestos-backed sheet flooring? How much or what sort of asbestos-flooring damage require special cleaning, testing, or remediation? This article series describes the probable risks of asbestos exposure from asbestos-containing floor tiles or sheet flooring as depending on the condition, covering, and location of the floor. Page top photo: many loose asbestos-containing floor tiles in an area like the one we show mean that there is a risk of harmful airborne asbestos that is sufficient that proper cleanup is needed. But a minor cut or scratch on a floor is a very different situation. A small nick or scratch on intact, secure, otherwise un-damaged asbestos suspect flooring such as shown in our photo does not require expensive nor scary "asbestos abatement" procedures. Reader Question: What should I have done when I accidentally cut into an asbestos-suspect floor tile? Reply: What are the risks of minor damage to an asbestos-suspect floor tile or sheet flooring covering? What is the level of risk from asbestos-suspect flooring that suffers a scratch or similar minor damage, and what should I do about such flooring. There is no reasonable chance that a scratch or cut into the surface of asbestos-suspect floor tile or sheet flooring using a smooth sharp-edged blade like a drywall knife is going to create a measurable level of airborne asbestos in the building, much less a hazardous level of airborne asbestos. It is more than a concern that very frightening articles about asbestos-hazards can lead to great fear over situations that present no hazard. For that case there are both monetary costs and stress from worry that can be both harmful and unnecessary. The fear of asbestos is exacerbated both by the normal worry that arises about something we think is dangerous and that we cannot see (so we fear it is beyond our control and that it sneaks up on us) and also by the preying on public fear by some companies who reap profit by providing testing or “asbestos spill cleanup” services that in some cases were not appropriate. So what should you do if you slice into an asbestos-suspect floor surface with a drywall knife? Wipe up dust: Damp wipe the scratch with a damp paper towel or rag, then throw that into the trash. Seal: When the floor is dry, you might elect to apply a light coating of spray or other shellac (I’ve also used a cotton swab) to seal the scratch and make the floor look smooth and shiny again. Experts advise that the safest way to stop potential asbestos hazards from an asbestos containing or asbestos-suspect floor tile or sheet flooring covering is to leave the existing floor in place, covering it over with a new layer of flooring. Asbestos is not like radioactive materials: it does not and cannot send up harmful materials through a layer that covers the floor surface. For situations where you must defer installing a new layer of flooring over an intact, essentially un-damaged asbestos-suspect floor tile or sheet flooring, I’ve described a successful approach using an epoxy floor sealant covered with a clear-coat to provide a durable walking surface that cannot release particles from the floor below. See ASBESTOS FLOORING LEFT IN PLACE for details. Or see ASBESTOS FLOORING HAZARD REDUCTION for a description of all of the approaches to preventing a hazard form asbestos-containing floor coverings. Where or When are there More Serious Asbestos Flooring Risks in Buildings? The US EPA points out in ADEQUATELY WET ASBESTOS GUIDANCE, EPA340/1-90-019[web article] that asbestos-containing floor tiles are considered non-friable materials but the materials can become friable with age or by grinding, sanding, demolition, etc. Researching indoor airborne asbestos hazards from building floors does not find scholarly, expert reports that a private home’s kitchen or den un-disturbed (that is not ground, chopped, etc) asbestos-floor covering in good condition produces measurable levels of airborne asbestos. Both research and my own anecdotal evidence from having spoken with people who worked in shipyards or industry where high levels of asbestos exposure occurred describe a work atmosphere that was sometimes so thick with airborne dust including asbestos that the air became opaque. The most frequent and serious asbestos-related illnesses such as mesothelioma occurred in workers from industry where the exposure was very high or sometimes in their homes into which workers un-knowingly imported high levels of asbestos-dust on their clothing. Beyond those industrial settings, research found potential asbestos hazards in schools that merited regulation of in-place asbestos flooring, most likely because of the situation I described above, high risk population (children spending lots of time in the building), and floors whose surface was abraded by foot traffic or by cleaning methods. Cohen, Nevin. "Regulation of in-place asbestos-containing material." Environmental research 55, no. 1 (1991): 97-106. Approximately two-thirds of New York City's 800,000 buildings contain asbestos. Most of this material is damaged or deteriorating. Legislation pending in the New York City Council (Bill number 453) would require virtually all building owners to inspect for asbestos, to develop management and maintenance plans to prevent disturbance of intact material, and to provide notice of the presence of asbestos to building occupants. This paper reviews the legislation and discusses its features that have been questioned. It concludes that regulation of in-place asbestos is necessary and appropriate. Cross, Frank B. "Asbestos in Schools A Remonstrance against Panic." Colum. J. Envtl. L. 11 (1986): 73. Following the discovery of asbestos-containing materials in some public schools, parents have responded with understandable concern for the health of children and demand a prompt action to remove the materials. Ironically, and tragically, the rush to remove asbestos from schools may significantly increase the hazard presented by the substance. A more carefully thought out policy is required to protect public health, for current school conditions may present little or no risk to students, while removal operations may create a new risk. This article examines the existing situation and proposes a redirection of attention and effort toward a more focused program to evaluate the risks posed by asbestos in schools, and where a significant risk exists, to ensure that the response actions are both safe and effective. Demyanek, M. L., R. J. Lee, K. A. Allison, and G. R. Dunmyre. "Air, Surface, and Passive Measurements in a Building During Spray-Buffing of Vinyl-Asbestos Floor Tile." Applied Occupational and Environmental Hygiene 9, no. 11 (1994): 869-875. This study was conducted in a commercial building with approximately 15,000 ft2 of vinyl asbestos floor tile. The primary objectives of the study were to assess potential emissions of asbestos structures from floor tile buffing, to determine the effects of direct versus indirect air sample preparation techniques, and to evaluate the usefulness of surface lift and passive adhesive sampling technologies for monitoring such activities. The asbestos-containing floor tile was determined to be homogeneous material and in relatively good condition throughout the facility. A 1000-ft2 room on the first floor of the building was selected for evaluation. Before the work began, background air, passive, and surface lift samples were collected and analyzed by transmission electron microscopy. A second set of samples was collected during the work activity and for approximately 8 hours after its completion. The results indicate that concentrations of asbestos structures <5 μm long rose slightly as a result of the work, while concentrations of asbestos structures < 5 μm in length did not. in addition, the indirectly prepared air samples produced higher asbestos structure concentrations than the directly prepared samples. data are presented summarizing these and other pertinent findings of the study. Murbach, Dana M., Amy K. Madl, Ken M. Unice, Jeffrey S. Knutsen, Pamela S. Chapman, Jay L. Brown, and Dennis J. Paustenbach. "Airborne concentrations of asbestos onboard maritime shipping vessels (1978–1992)." Annals of occupational hygiene 52, no. 4 (2008): 267-279. The exposure of shipyard workers to asbestos has been frequently investigated during the installation, repair or removal of asbestos insulation. The same level of attention, however, has not been directed to asbestos exposure of maritime seamen or sailors. In this paper, we assemble and analyze historical industrial hygiene (IH) data quantifying airborne asbestos concentrations onboard maritime shipping vessels between 1978 and 1992. Air monitoring and bulk sampling data were compiled from 52 IH surveys conducted on 84 different vessels, including oil tankers and cargo vessels, that were docked and/or at sea, but these were not collected during times when there was interaction with asbestos-containing materials (ACMs). One thousand and eighteen area air samples, 20 personal air samples and 24 air samples of unknown origin were analyzed by phase contrast microscopy (PCM); 19 area samples and six samples of unknown origin were analyzed by transmission electron microscopy (TEM) and 13 area air samples were analyzed by scanning electron microscopy (SEM). In addition, 482 bulk samples were collected from suspected ACMs, including insulation, ceiling panels, floor tiles, valve packing and gaskets. Fifty-three percent of all PCM and 4% of all TEM samples were above their respective detection limits. The average airborne concentration for the PCM area samples (n = 1018) was 0.008 fibers per cubic centimeter (f cc−1) (95th percentile of 0.040 f cc−1). Air concentrations in the living and recreational areas of the vessels (e.g. crew quarters, common rooms) averaged 0.004 f cc−1 (95th percentile of 0.014 f cc−1), while air concentrations in the engine rooms and machine shops averaged 0.010 f cc−1 (95th percentile of 0.068 f cc−1). Airborne asbestos concentrations were also classified by vessel type (cargo, tanker or Great Lakes), transport status (docked or underway on active voyage) and confirmed presence of ACM. Approximately 1.3 and 0% of the 1018 area samples analyzed by PCM exceeded 0.1 and 1 f cc−1, respectively. This data set indicates that historic airborne asbestos concentrations on these maritime shipping vessels, when insulation–handling activities were not actively being performed, were consistently below contemporaneous US occupational standards from 1978 until 1992, and nearly always below the current permissible exposure limit of 0.1 f cc−1. Williams Jr, Marion Glenn, and Robert N. Crossman Jr. "Asbestos release during removal of resilient floor covering materials by recommended work practices of the resilient floor covering institute." Applied occupational and environmental hygiene 18, no. 6 (2003): 466-478. The release of asbestos during maintenance and removal of resilient floor covering is of concern to health professionals and many regulators. This study assesses the asbestos levels observed during removal of resilient floor covering products using the "Recommended Work Practices" (1995) of the Resilient Floor Covering Institute or other methods requiring containment (Controls). The 1995 "work practices" require wet removal or dry heat removal but do not require the use of respirators. Wet removals of sheet vinyl/separated backing, 12" 2 12" vinyl asbestos tile/mastic, and 9" 2 9" asphalt tiles/mastic were conducted and the air was sampled during each procedure. Settled dust samples were collected at the sites of RFCI square tile removal and pieces of each type of tile were broken in a mini-enclosure to evaluate asbestos emissions. Analyses of the air samples collected during the removals showed that the RFCI methods did not produce asbestos counts significantly different from the Control methods requiring containment. Only a small number (0.7%) of fibers and structures, counted and measured by Analytical Transmission Electron Microscopy, would have been counted using the rules for Phase Contrast Microscopy in the 7400 method specified by Occupational Safety and Health Administration regulations. This indicates workers in similar situations without respirators are likely to have unknown exposure levels. A high percentage of these fibers and structures are 5 micrometers or less in length, smaller than 0.5 micrometer in diameter, and are easily inhaled. The RFCI air sample and settled dust data may cause regulators to consider requiring respiratory protection, cleanup procedures, and methods to control asbestos migration. Other areas that might be addressed are clearance levels and their measurement, removal area size, bulk sample analysis by transmission electron microscopy if polarized light microscopy reports less than 1 percent asbestos, better worker exposure evaluation, and supervisor/worker training in accordance with the Model Accreditation Plan. Continue reading at ASBESTOS FLOORING HAZARD LEVEL ASSESSMENT or select a topic from closely-related articles below, or see our complete INDEX to RELATED ARTICLES below. ASBESTOS FLOORING DAMAGE HAZARDS at InspectApedia.com - online encyclopedia of building & environmental inspection, testing, diagnosis, repair, & problem prevention advice. Hi. I have a question about asbestos in floor tile and its removal. I work at a public school and the school had a contractor come in to remove some flooring that was starting to "buckle up" in some areas due to water seeping underneath it. When the contractor came I happened to be around and I asked him before he started if the tile could be asbestos (the school was built in 1952). He looked at it and said it wasn't 9x9 inch, and he wasn't sure what was underneath it yet, so he couldn't say for sure. When I started at the school I was made aware by my boss that there is asbestos tile underneath the carpet in the classrooms, but he didn't mention the hallways, where this work was going to be done. I kept a watch on the contractors as they were removing the tile flooring, (I stayed a safe distance from them...like outside the building through a window). I noticed they used no masks and there was no plastic barriers put up inside the building. They were breaking the tile up though because I noticed them shoveling it up and putting it in the big 55 gallon plastic barrels used for garbage. They stayed for about 2 days doing this. When they were done they left these filled barrels of the tile for us to dump! I didn't want to be involved at all in their dumping! My boss came though and he said he needed my help in dumping the barrels in the outside container for garbage. I REALLY wanted nothing to do with this and I panicked inside. I was afraid though to ask about its safety. When we went outside to dump them I kept my distance as much as possible. No one can say just from text whether or not the floor tile that was taken up contained asbestos, though the lack of dust control and personal protection sounds to me like an amateur was doing the job. Even non-asbestos-containing dust can be hazardous, especially at acute exposure levels. From the age of the school (1952) some asbestos containing materials would be expected to be present in lots of items, especially floor tiles. And the contractor's assertion that only 9" floor tiles contain asbestos is incorrect. - building management can make be sure all of the demolition dust has been properly cleaned and removed - if it's asbestos-containing, a higher level of cleaning and post-cleanup testing are needed. And for your question of whether or not the contractor would or would not know if the floor contained asbestos? My OPINION (not a lawyer) is that the contractor is legally obligated to be competent to perform the work for which s/he is hired; at a school, and removing flooring, that should include the ability to recognize a "red flag" that would stop the job until an asbestos hazard assessment has been made by a professional. Faced with very high costs of an asbestos cleanup, and worried about causing a (perhaps inappropriate) panic among parents of school children, building managers I've met have sometimes opted for an "ignorance is bliss" argument. At a large Jewish Community Center in New York where it was patently obvious that there was asbestos-containing pipe insulation and flooring, the building management showed me a "report" asserting that the building was "asbestos free". The report authors simply stayed out of building areas where asbestos found. I was pulling up some carpet in my basement today and found that there is tile on the floor beneath it. That didn't seem like a problem to me except in one corner the tile came up with the carpet and there is a green tile beneath that. The house was built in 1950. should I be concerned that the green tile has asbesto in it? Don from the age of materials you describe it's a good chance you have one or more layers of asbestos containing floor tiles, though of course I can only speculate with so little information. However if the floor is covered with additional layers of tile or even carpeting, it's unlikely that it is being disturbed enough to produce a detectable level of asbestos (from that source) in the building air or dust. 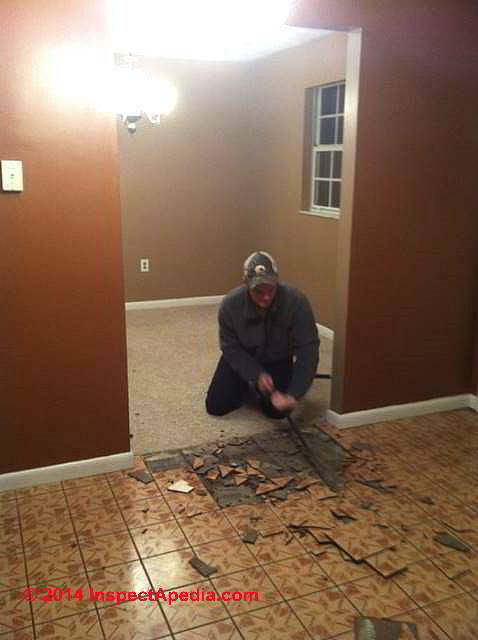 A single piece or two of broken tiles are not measurable; what you want to avoid is demolition making a big dusty mess. Search our site for "How to Reduce the Hazard Floor Tiles That May Contain Asbestos" or "ASBESTOS FLOORING HAZARD REDUCTION" to read about procedures for handling the flooring. Asbestos-containing flooring in good condition does not have to be removed from a building, and worse, inept removal can create a much greater hazard than leaving most asbestos materials in place. Asbestos was widely used as a filler in both asphalt-based and some vinyl based floor tiles of varying thicknesses, and extending to some thin, flexible self-adhesive backed tiles as well as some sheet flooring. 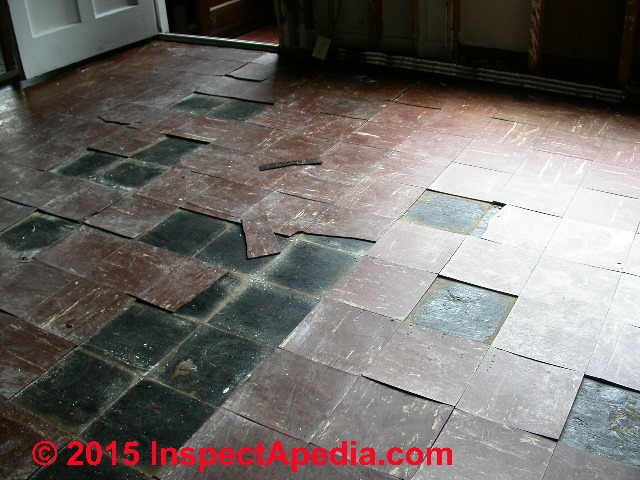 See ASBESTOS FLOOR TILE IDENTIFICATION PHOTOS 1949-1959 for an extensive photo guide to asbestos-containing flooring materials. Hey Joe there's always a "risk" when removing anything that has to do with Asbestos. I understand that you probably didn't take caution at all with the removal and you probably weren't wearing the proper protection. There's two things that could be red flags. 1. I'd be worried if you were a constant to heavy smoker. 2. I'd also be worried if you've done this type of removal many times before or after without protection. The only way to know for certain if true damage has been done is tell your Doctor or care provider about this incident and ask for their advice.